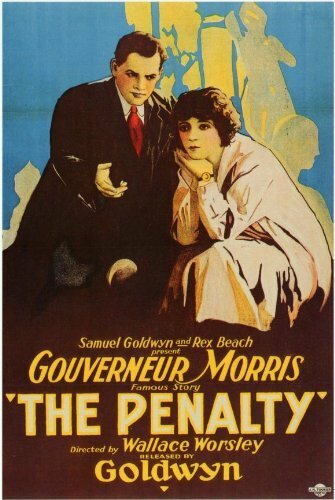 Based on a novel by Gouverneur Morris, THE PENALTY is the first tour-de-force of Chaney’s commanding dedication that we can see in its entirety - and is satisfying for combining his new trademark of external physicalisation with deep reserves of boiling internal intensity on-screen. Lon plays the victim of a childhood road accident whose legs are amputated rashly by his doctor. No-one believes that the boy overhears the doctor’s mentor Dr Ferris (Charles Clary) offering a lie to cover up his protégé’s mal-practise. From then on, we jump forward twenty-seven years to Chaney as the adult, seething with long-burning resentment and the desire for revenge. He has matured into an underworld crime kingpin assuming the super-villain mantle of ‘Blizzard’, a permanently suggestive sour grin of evil promise etched on his face. He devises a plan to wreak retributive havoc on the whole city by pouring in angry immigrant workers to cause criminal chaos while his mob commits widespread looting. Meanwhile, on a personal level he intends to walk again with the help of an old ‘friend’ - by any means necessary. Chaney’s Blizzard is a gleefully macabre villain, his Noir-ish gangster charm and lasciviously raised eyebrows reminiscent of Jack Nicholson’s Joker. (Strangely enough, his later make-up design for THE PHANTOM OF THE OPERA would partly inspire Bob Kane in his conception of that very character). His relentless pursuit of grisly revenge is also sheer Grand Guignol in its single-mindedness. Though reduced in stature, Chaney’s powerhouse of suppressed rage towers over everyone in the film. He somehow manages to make a double crutch-supported stance look like a power position. Director Wallace Worsley makes valuable use of close-ups in capturing the ferocious pitch of Chaney’s performance. Mostly he emotes with electrifying restraint (aside from a couple of over-cooked bursts of triumph) – admirable especially when you consider how recent a technical innovation the camera close-up was for actors to modulate. Chaney doesn’t relentlessly hammer away at full throttle though. He is apt to soften in the face of the kindness shown to him by Rose, the government undercover agent who infiltrates his compound and discovers his fully-equipped operating theatre. She soothes his rage and cannot bring herself to betray him. He in turn values her goodness which allows him to play notes of sensitivity on his piano and life hitherto unknown to him. These gaffes aside, they introduce a vital plot point whereby Blizzard answers the ad to covertly insinuate himself, to truly devilish purpose, into the Ferris family. If we haven’t already guessed what his surgical space is being prepared for, Blizzard eyes up the boyfriend remarking: “What an admirable pair of legs”. Fortunately – SPOILER ALERT! – Before he can literally sweep the boyfriend off his feet, he is prevented from blackmailing Ferris into operating. We’re then treated to an expository flashback reminding us that it’s a contusion on the base of Blizzard’s skull that is responsible for his unbalanced desire for revenge (cunningly letting the young hacksaw quack off the hook! ), and so another procedure is performed to relieve the pressure and restore Blizzard to the man of moral virtue he should always have been. In its ending THE PENALTY scores bonus points for, like 2007’s ATONEMENT, it provides a moving explanation for the title which resonates poignantly. The reconstructed Blizzard is shot by sceptical former associates as he plays the piano, but as he dies in Rose’s arms he accepts he has deserved his fate, assuring her with touching understatement: ‘Don’t grieve my dear…death interests me’. 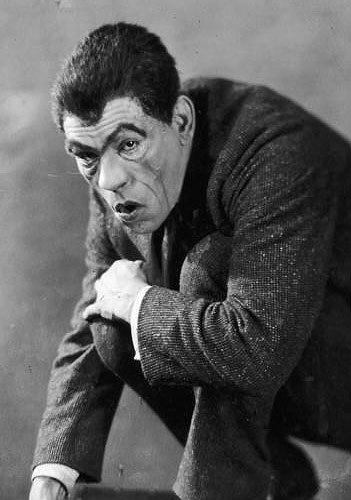 Whilst the film has its flaws and some stilted support playing, (Adams has the irritating habit of delivering her lines wistfully out-front as if in a bad stage melodrama) Lon Chaney single-handedly compels the audience with a masterful and exciting central performance slamming down a calling-card for the future. He could, for example, have taken the easy route of camera trickery to suggest his disability but instead strapped his legs behind him to physically cut himself down for real. Imagine the agony at the end of every shooting day as he finally straightened his body out. Although he had no truck with starving for his art, a little suffering was part of his astounding work ethic and would be an admirable example to others. 1922 was to prove a busy year for Chaney and one in which he consolidated his reputation for stunning metamorphosis. Amongst his films released was THE TRAP, the first film to publicise him as ‘The Man of a Thousand Faces’. There was also his second time of portraying a Chinese character (previously in 1921’s BITS OF LIFE) in SHADOWS for which he won great acclaim for his realism. He played Fagin in OLIVER TWIST for director Frank Lloyd, opting (as Jonathan Pryce would later do in the mid-1990s musical version) not to go for a traditional Jewish stereotype but “as a character with more universal appeal”, still incorporating his own transformative make-up and physicality. A BLIND BARGAIN (1922) for Goldwyn Pictures was notable as one of the few clearly-defined horror films of Lon Chaney’s career and reunited him with director Wallace Worsley from THE PENALTY. It’s a lost film, but a few still photos remain to whet our appetite as to the extreme diversity between the dual roles he plays. Chaney doubles as Dr Lamb, a brilliant yet maniacal surgeon with a God complex who experiments upon animals to extend human life, and one of his ‘creations’, a bestial ape/human hybrid. In the photos, his Lamb is coldly professorial, reminiscent of a Brylcreemed Trostky with a precise goatee beard and pince-nez glasses. The ‘Ape-man’ throwback is formally-suited yet a buzzcut-haired hunchback (prefiguring Chaney’s star-making Quasimodo), with a high arching mono-brow, cowering and pitiable. Sadly, Chaney’s enticingly-detailed character work was eclipsed by the inevitable controversy of the film’s taboo subject matter. The studio was forced to re-write the content of the title cards four times and drastically edit the footage before it was acceptable for release.